Visitors to Shetland Wool Week span the globe. 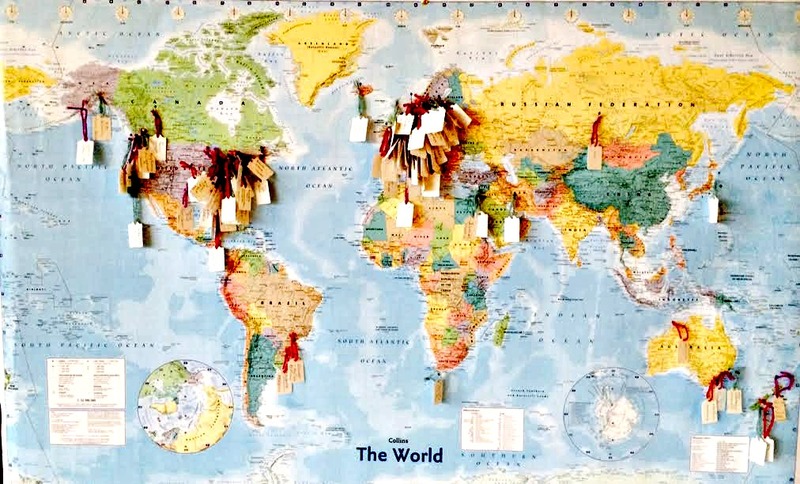 Each tag represents a participant. Photos courtesy of Promote Shetland. 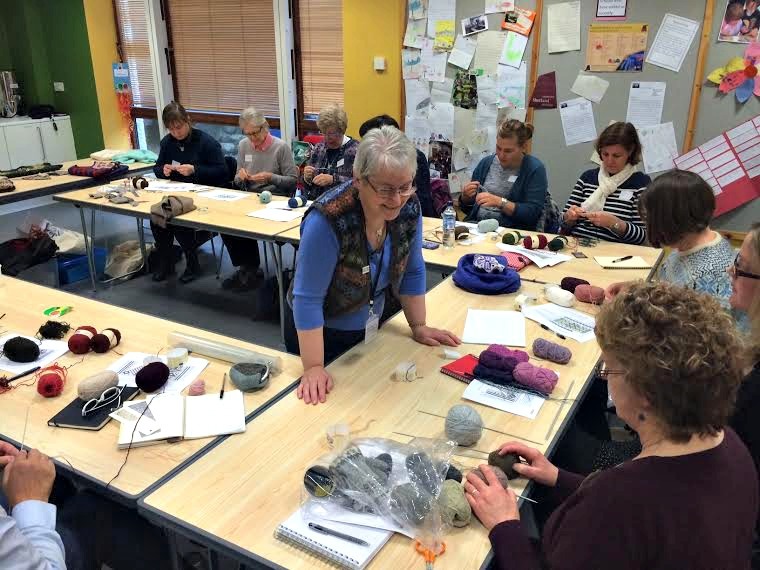 Hazel Tindall teaching during Wool Week. 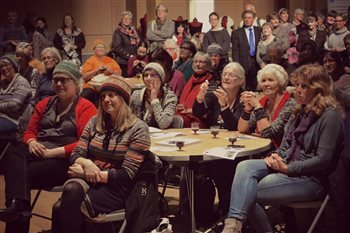 The fifth annual Shetland Wool Week was bigger and woollier than ever, with over 300 participants from around the world. Wool-centric folks from Brazil, North America, Australia, Israel, and Japan met in Lerwick, capital of the Shetland Isles, for a week of workshops, lectures, and exhibitions. The Shetland Guild of Spinners, Weavers, and Dyers hosted the Wool Week Hub at the Shetland Museum and Archives, where participants could drop in to chat with textile artists and get information about the week's events. Beyond the fiber arts workshops and gatherings in Lerwick, many shops and studios around the Isles were open and ready for visitors. Traveling to Shetland but can't make it during Wool Week? Many of these shops and studios are part of the Shetland Arts and Crafts Trail. Hazel Tindall, member of the Shetland guild and internationally known knitting designer and instructor, was the Patron of Shetland Wool Week 2014. She had a busy week with the many happy knitters in her popular workshops. Hazel's patterns and new DVD can be found on her website. In honor of the event, she designed the Shwook hat. 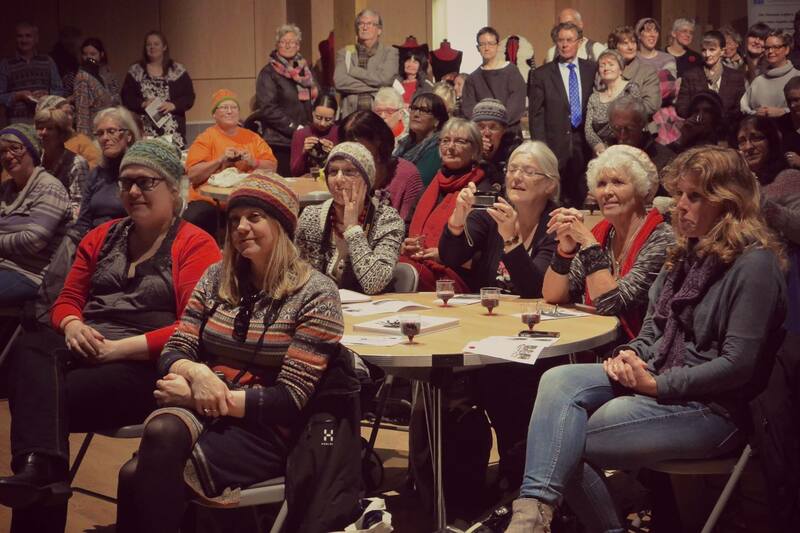 The lucky spinners, knitters, and weavers heading to Shetland could sport their hats during the week, and those of us who were joining the festivities from afar could knit Hazel's beautiful hat and be a part of the fun. Find the free Shwook Hat pattern here. Mark your calendar! Shetland Wool Week 2015 will be held September 26‒October 4. Find out more by following the event on Facebook.